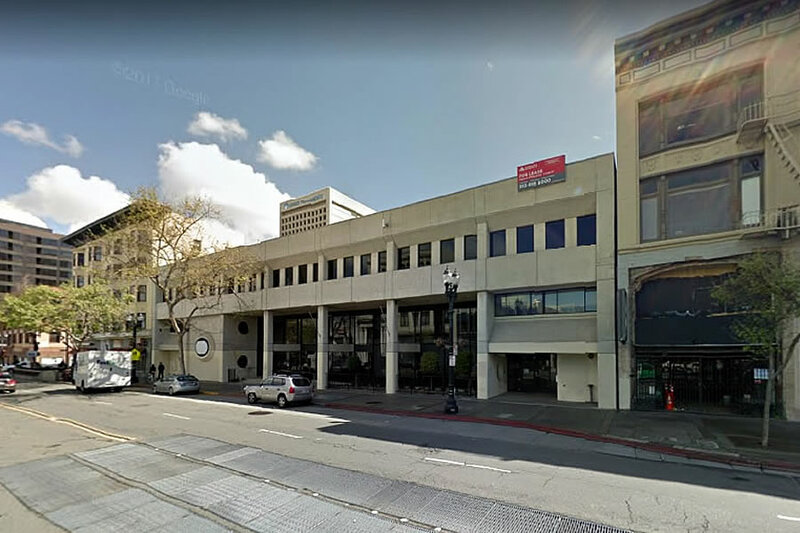 Plans to raze the three-story Community Bank of the Bay building at 1750 Broadway, between 17th and 19th Streets in Uptown Oakland, are in the works. And as proposed by Rubicon Point Partners, a 37-story tower with 307 apartments over a 210-car podium garage and 5,000 square feet of ground floor retail space will rise upon the building’s 27,000-square-foot parcel which primarily fronts Broadway but includes a parking lot spur to 19th Street as well. And the Broadway façade of the building’s podium garage, the street entrance to which would be by way of 19th, would be detailed with a series of angled metal screens. The plans are slated to be presented to Oakland’s Design Review Committee next week. We’ll keep you posted and plugged-in. Beautiful. If only SF could build buildings half as good looking. If only Oakland can: it’s been a lost opportunity – not to mention a memory of better things – for a long time. Oakland is still doing much better than most cities with three beautiful old theaters in and around downtown. The FOX, Paramount, and Grand Lake are restored opulent treasures most American cities would be lucky to have. Oh please. SF is currently building the similarly tall Jeanne Gang-designed tower at 160 Folsom that is leagues beyond more beautiful than this pretty basic design. Basic with a capital B.
Nah. The Jeanne Gang one gives me vertigo. Looks like something out of that movie Inception. One of those parametric carbuncles that’s trying to hard to be interesting. It would have looked good in Miami Beach, circa 1980. Looks like a pretty basic building to me. Not ugly but certainly not beautiful or innovative. This would be the tallest building in Oakland if constructed as is. 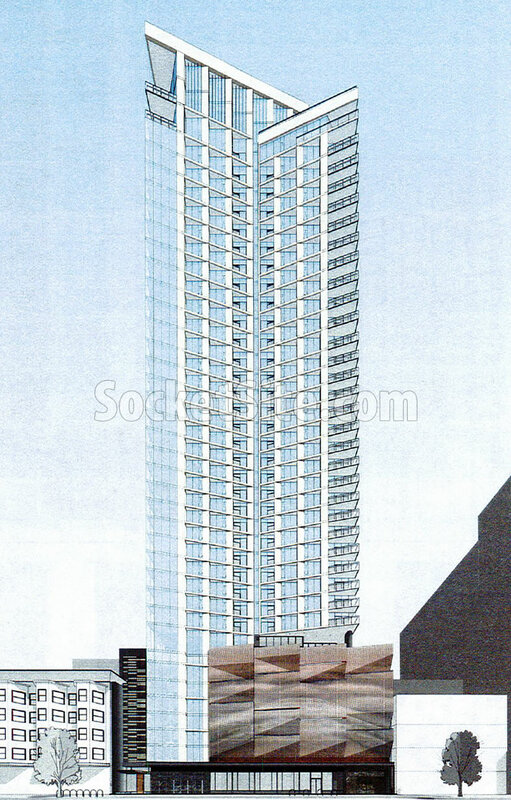 There is another 33-story residential highrise under construction just down the block at 17th & Broadway. Webster, Franklin, and Broadway are going to be the upper east side of Oakland filled with residential highrises. The building is okay but the 5 story podium garage facing Broadway is a problem. Nevertheless, looking at that picture we can clearly see that downtown Oakland has tremendous character and a very bright future. You make some good points. I just think the podium takes away from the attractiveness and elegance of the building. However there is no question that this building would be a huge improvement to that block and it fits right in with the residential density coming to transit friendly Broadway. This is great for Oakland and for the rest of our region. It’s a problem because Broadway is Oakland’s main street. 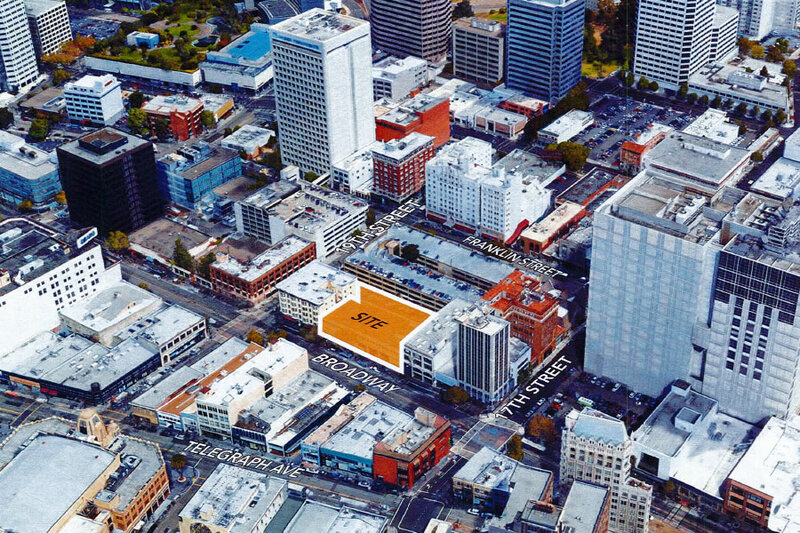 Would we be ok with a 6 story parking podium fronting Market St? Absolutely not is the answer! I am excited for this new wave of highrise development coming to Oakland but the amount of parking being introduced on locations siting directly atop BART stations is beyond shortsighted. We shouldn’t let our hunger for long overdue development be steered by outdated 1970s developer proformas. Very true. These new highrises on Broadway are basically in top of the 19th Street BART station. I was just in DTO last Saturday and the place is incredibly walkable. You can easily walk from the Lake Merritt BART station to the 12th Street and 19th Street BART stations. Also great restaurants and bike stations everywhere. You are right, no need for so much parking on Broadway or really anywhere in downtown Oakland. Add another 15-20 story shard to the top of this to break through the increasing DTO tabletop skyline. Nobody should be allowed to build a parking garage literally on top of a BART station. I’m not that mad at parking. I live in a very similar building in SF (NEMA) which is also very close to transit, and while most residents have cars, most don’t use them to commute, and many more don’t use them even on a weekly basis. They’re for taking the dog to the beach, going up to Calistoga/Tahoe, and for the occasional huge run to Bed Bath and Beyond or Trader Joe’s. People have kneejerk reactions to seeing parking in buildings as if every spot will be used multiple times a day…probably true out in more remote locations, but in dense urban areas the car is kept as an option, not as a staple. The parking facing Broadway is frustrating, though. I am hugely in favor of these towers in Oakland because, like Mid-Market projects, they are being geared toward professionals who live and work in our area, vs. the condo projects in Transbay which are largely going to be weekend homes, second homes, trophy residences, etc. Not that those are inherently bad per say, but because buildings like this will fix our housing crisis, not the beautiful condos at 181 Fremont. Location of this thing couldn’t be better. In the heart of everything and such an easy BART ride into work. More please! fingers crossed that a critical mass of these types of projects can be built before the economy turns….oakland will be changed forever, with no going back. 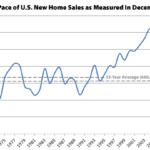 The critical residential mass is definitely coming. We currently have a 40 story, a 33 story, and a 24 story residential highrise under construction. Another building on Webster was also just demolished for a 25 story highrise. There is also a 29 story modular highrise ready to break ground. In three years we won’t recognize Downtown Oakland. Don’t forget 1100 Broadway and 601 City Center! Although, these are office buildings they should help fill these coming residences with office workers. I think some of these developers are counting on that in part. Yes, good point. All this construction is great for Oakland and for the region. There is still plenty of space for more offices and residential although the surface parking lots are moving fast. btw: oakland really does need a marquis building in its skyline. I am surprised developers are not going for this – something like the transamerica pyramid, tribune tower, BOA building, or salesforce tower. there is an opening for something truly iconic/prestigious to be built. The marquis building in Oakland should be in the Lake Merritt Financial District next to the Kaiser Center. I’ve been inside a 24 story condo right on the Lake and the views are just breathtaking. The problem with the parking podium is that its completely inappropriate for the principal street in Oakland. All floors facing Broadway should have façades that are active; not just at ground level or several floors above. Even the rendering illustrates the point; the building at the corner of 19th and Bdwy has a rhythm of bays and fenestration that adds scale and vitality. I really don’t like the parking screens even on the new building at 17th and Webster; but lets not continue the trend on our main commercial street. Granted, this proposal is a huge step forward, but let’s aim for a higher standard on Broadway. If this is approved as currently designed, expect more to follow. I agree. Broadway is Oakland’s “Main Street” and should be respected. We have some great things already happening like the renovated Latham Plaza and the new landscape medians on the 1600 block. The Cathedral Building opening up to Latham Square Plaza really adds a whole lot of character and charm to Broadway. A new Peet’s Coffee is going in at ground level at the Cathedral Building with outdoor dining opening up to the beautiful Latham Square Plaza. Let’s build on the improvements by adding elegant buildings which will respect the new vibrancy and pedestrian experience on Broadway. Unfortunately, Oakland long ago lost its claim as the retail center of the East Bay. Now retail is concentrated in monotonous stucco enclaves like Bay Street Emeryville and Broadway Plaza Walnut Creek. The renaissance of downtown Oakland should celebrate and complement the incredible historic commercial architecture of Broadway. Architecture of a main street should not be cheapened with metal screens and gimmicky angles concealing parking garages. This same development/design team already designed something similar at 2270 Broadway. Planning department staff; please take note. If the “planning staff” took note, there would be multiple comments here berating them for overreaching and interfering with the design of the building. I like this high rise…it’s basic, yet efficient. 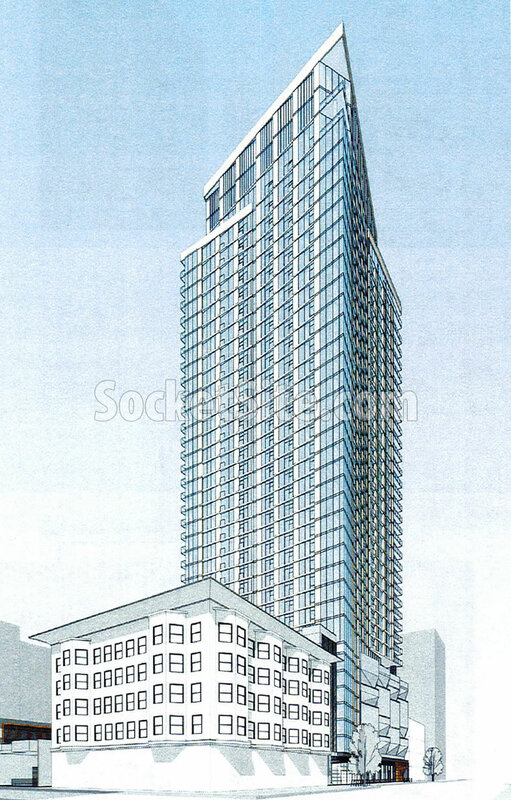 I just saw a new rendering of this proposed building on another site. I’m beginning to really like this building. They have this building along with the under construction 33 story building at 17th & Broadway, and frankly, this one looks more elegant. Let’s hope this building comes to fruition. This will be a great addition to DTO. I’m just excited for the pending crash when all of this gets affordable again.